When people ask me that super-tricky question about the best place I’ve visited, I can’t really give a good answer, but my two weeks in Tunisia always rate extremely highly. Tunisia wasn’t exactly a destination I’d always dreamed of – in fact, I wasn’t even sure where it was on a map. I had two weeks free from teaching over Christmas shortly after starting my job in Bratislava and when I went to book a flight to somewhere – anywhere! – most destinations were already booked out; the travel agent suggested backpacking Tunisia and I went for it! My first caveat before I tell you my Tunisia itinerary: this was a pretty hectic two weeks, and that’s because I wanted to see a lot, and I only had two weeks since I was employed at the time. Having said that, I didn’t ever feel exhausted or anything – I was actually more exhilarated from seeing so many amazing places – each day was a totally different experience. If you have more time, you could add a couple of destinations or just do it all a bit slower. I had no idea that for Europeans, the coastal resorts of Tunisia were popular sun-seeking holiday destinations. (One of the many European equivalents for Western Australian people’s Bali, I guess!) This means that there are actually lots of flights into Tunisia, and not just to the capital, but Tunis is where I landed, on a flight in from Vienna. I loved Tunis – a not-too-overwhelming capital – and I found it easy to find accommodation and food. (I didn’t book anything on this trip prior to arriving – it was very much a pure backpacking turn-up-and-look trip.) The medina of Tunis is crowded and fun and full of all different kinds of market stalls, and the occasional fellow who wants you to come and see the nice view from his second-floor shop but really wants to sell you his carpets (I always declined). My absolute favourite place in Tunis was the Bardo Museum. (FYI: I took a taxi there because it was cheap and quick.) 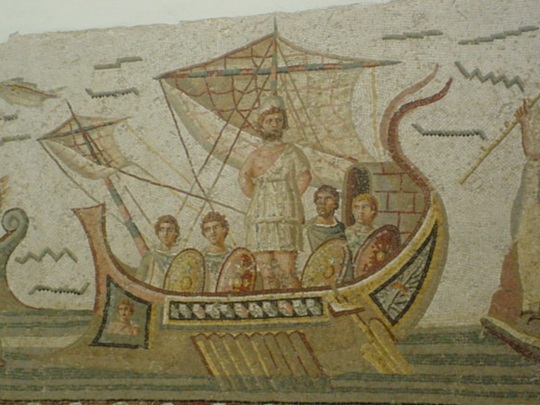 It is FULL of amazing mosaics and ancient artefacts. The mosaics really caught my attention. The other main attraction I visited in Tunis was the Zitouna Mosque – the main mosque for the city and apparently the oldest building in Tunis. When I visited women couldn’t get beyond the coutyard but that was far enough to see how impressive it was. One of the best things about Tunisia, especially for someone like me from a vast country like Australia, is its small size – so my next stop after Tunis was just a half-hour train ride! I spent a couple of nights, including Christmas (not celebrated there of course but I stopped to celebrate!) in Sidi Bou Said. It is basically Tunisia’s answer to Santorini (but a whole lot cheaper) – practically every building is white and blue, it’s a hilly town and it’s full of cats. In other words: you just want to take photos all the time. A great place for wandering. Another spot that’s very close to Tunis is Carthage, which I actually visited on the train while I was staying in Sidi Bou Said (it’s three stops away!). 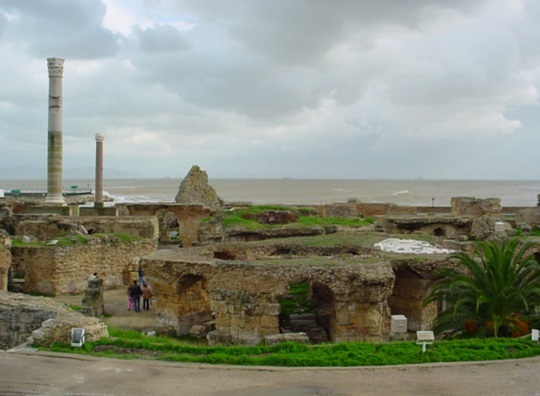 Carthage of course is home to a bunch of famous Roman ruins and it’s well worth exploring – I had a combination ticket which gave me entrance to five different Roman ruin sites in and around Carthage – I found the Antonin Baths the most impressive. A view over the Antonin Bath ruins in Carthage, Tunisia, towards a stormy sea! From here I headed south again to Tunis and then caught a train down the coast to Monastir, a three-hour trip south. I was a bit worried at first because there was evidence of a few touristy resorts (not my thing!) and I was told a lot of German tourists visited – but I ended up staying in a small non-resort hotel on the beach. 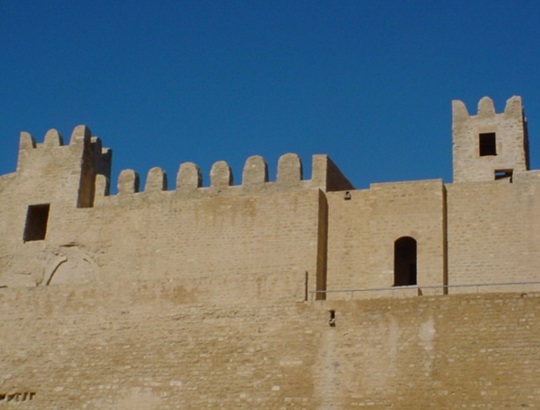 It was very close to the ribat (military fort) which is the highlight of Monastir for me – this ribat has featured in films like Monty Python’s Life of Brian. Moving on from Monastir was one of the more travel-heavy days on this trip and getting down to El Jem, further south and a bit inland, involved a stop in Sousse for a couple of hours. But it was well worth it. El Jem is famous for its amphitheater – which is usually referred to as a colosseum because it sure looks like one! My bathroom window had a view to it and I had the chance to explore it, climbing all the way to the top tier and even looking underneath where the lions would have been back in gladiator times. It was definitely a highlight of my Tunisia backpacking trip to look at this colosseum from the toilet! Moving on from El Jem, my Tunisia itinerary saw me catch a train and then a louage (a minibus – much more frequent than the regular bus) to get to Matmata. This is well into the southern half of Tunisia and getting very close to the Sahara Desert and the landscape certainly reflects this – plus half the people live underground! 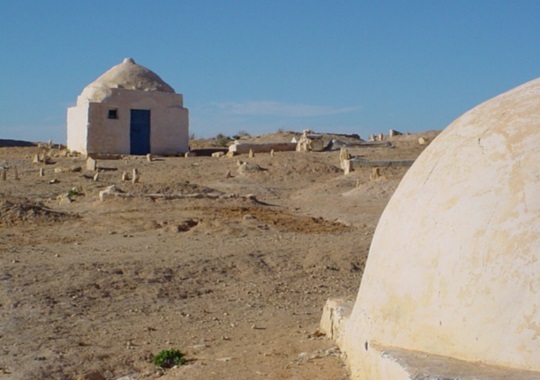 I stayed in the Hotel Sidi Driss which is famous for being a location from Star Wars. The “room” was basic and the door wasn’t really a whole door but I guess the undergroundness meant I kept warm – weird! The next day – and yes, it sounds rushed looking back, but it didn’t feel it at the time – I moved on to Douz, south-west of Matmata (but I stayed in Douz for two nights). This involved louage rides again, going to Nouvelle Matmata, then Gabes, then Douz. Here the proper desert sand dunes began. Not only that, I managed to accidentally time my arrival to coincide with the annual Sahara Festival. In true credit to how easy I found it to travel in Tunisia, it still wasn’t impossible to find a budget hotel room at a time when there really should have been no room at the inn! As if the Sahara Festival wasn’t fun enough, I also went on a day trip on a camel out into the Sahara Desert and had lunch in a Bedouin tent. It was kind of touristy (my camel’s name was Ali Baba …) but I still loved it. More louage rides and it was time for two nights in Tataouine – south-east of Douz and the furthest south I got in Tunisia. Apart from being the inspiration for the planet of Tataouine in Star Wars, this area is known for its Berber granaries – amazing structures designed for storing and protecting grain. I spent two nights here as it was really a whole day affair to get out to see the granaries like Ksar Magabla and Ksar Haddada (also used as a setting in Star Wars – see a theme here?!). 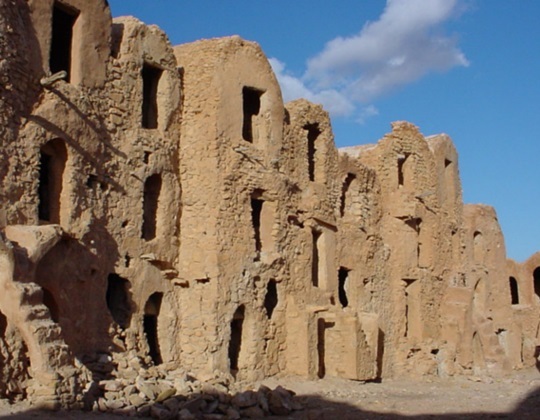 Ksar Megabla is one of many old fortified granaries near Tataouine, Tunisia – so cool! Next stop: a real island. A long-distance bus ride from Tataouine took me on a car ferry and on to the main town on Jerba (or Djerba) Island – Houmt Souq. Parts of Jerba have more touristy resorts but staying in town worked out perfectly – where I stayed was a former funduq which means the bottom floor used to be home to animals! Near Houmt Souq is the Borj Ghazi Mustapha fort, which reminded me of the ribat in Monastir. Wandering around was interesting in itself as there were lots of local fishermen to observe. Sadly, I thought, there was also a big modern marina development underway which would be all operational by now – I hope it hasn’t changed Houmt Souq too much. The plan was to take the night bus/train (via Gabes) out of Houmt Souq after my second day … but it’s a trip that seems to sell out quickly. A pretty unpleasant night bus deposited me in Tunis at 3am instead, but so be it, right? For two more nights I was based in Tunis before flying back, but on the last day I got out of the city and went east to Dougga (via Tebersouk). Dougga is home to an amazing collection of Roman ruins, much of it pretty well-preserved. And there are animals wandering around too! It was gorgeous and worth the trip. And then, sadly, the two weeks in Tunisia was over and I had to get back to work. Over the past few years quite a few people have asked me questions about a trip to Tunisia backpacking, so here’s a short collection of the most common questions and answers. Just ahead of those questions – this map from Wikitravel helps put the itinerary into a bit of perspective, too (unless your geography of Tunisia is better than mine was before I went). Good question. Since I went, there has certainly been some unrest there and the neighbouring countries are more impacted by terrorist activity than they used to be. I usually refer to the Australian government safety warnings (they seem to be more immune to hype and reasonably sensible) although in this case the British travel advice is probably relevant too as a lot more Brits would visit Tunisia than Aussies. As I update this in May 2018, the main government travel warnings suggest particularly avoiding areas close to Libya and Algeria. Having said all that: I felt extremely safe in Tunisia. How much does accommodation cost – are there no hostels? I certainly didn’t come across any hostels but I didn’t need to – the budget hotels were so cheap. A private room usually cost between US$20 and $40 (although most often with shared bathrooms). What itinerary would you suggest for one week in Tunisia? It’d still be worth going for only a week – I would be inclined to stick to the north (shorter distances) and try Tunis, Sousse/Monastir, El Jem and back. If you can stretch to have 10 days in Tunisia you could also include some of my day trips or side trips like Carthage and Dougga. Have you been to Tunisia? Have I inspired you to think about going? I would love to visit Tunisia! I visited both Morocco and Turkey this year and they have me wanting to spend more time in Northern Africa and the Middle East. I never thought I’d be drawn to this areas, but there you go. Also, I had no idea Tataouine in the movies was based on a real place! So cool. Olivia – if you liked Morocco I’m sure you will love Tunisia. Such a fabulous country! Hope you get there, enjoy! Great advice! 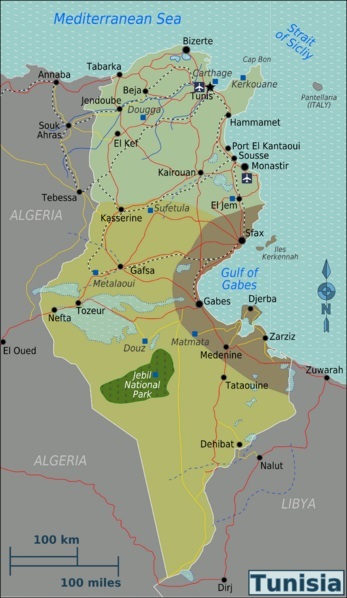 I have a Tunisian friend, and have always been curious about the country. I hear it is quite safe, and it looks like you saw some amazing sights while you were there. Thanks for sharing. Thanks Katie! It really is a country full of amazing sights. Hope you get there some day! Hi Crystal – you lucky thing, I’m jealous! I stayed at a little hotel (I think about 10 rooms) called the Hotel Sidi Bou Fares. It’s 10 years ago now so while I remember at the time that it was really cheap, if I look online now some of the TripAdvisor reviews suggest it is overpriced – http://www.tripadvisor.com.au/Hotel_Review-g316117-d602465-Reviews-Hotel_Sidi_Bou_Fares-Sidi_Bou_Said_Tunis_Governorate.html – but I really thought it was very cute! i would love to go to Tunisia! Sounds like a great itinerary. How was the food there? A brilliant place Bethaney, I highly recommend it! Food was delicious – a lot of couscous but luckily I like that – and quite a big French influence on the food as well. Lots of very tasty stuff. Add it to your list! Thanks for this amazing itinerary. Considering a trip in mid to late April. You mentioned that you didn’t book anything ahead of time… this cause no problems for you? Also, wondering how much time and money could be saved by renting a car for this trip? Hi Elizabeth – I’m pretty much of the habit of not booking ahead on those kind of trips and it worked out great – I never had too much trouble finding anywhere and it meant I could change plans at the last minute! The costs of transport were SO cheap that I don’t imagine you could save money by renting a car – it could be quicker though, as sometimes you have to wait around until the buses are full before they’ll leave. Enjoy!! hi! I’m going to spend some months in Tunis from end of october this year 🙂 I’m going to live in Tunis at a host family and I’m going to travel alone. How is it to be a lonely traveler as a woman? Easy to travel outside the city center alone at night? ( for nightlife for exemple) i have little knowledge in french so far but I’m hopefullt going to attend a french course part time to getting better 🙂 How is the english among tunisians in city center of Tunis? Hi Charlotta, you lucky thing, you’ll love it! I would say though that I didn’t feel that comfortable outside at night as a woman – I did it a couple of times when I was there and found I got a lot of unwanted attention. Your host family should be able to tell you some better places to go perhaps. I should say I never felt actually in danger – just a bit harassed! And English wasn’t too bad but would be great to have some French. Enjoy! Great post, thank you! I’ve been researching a trip to Tunisia and you just answered all of my questions! 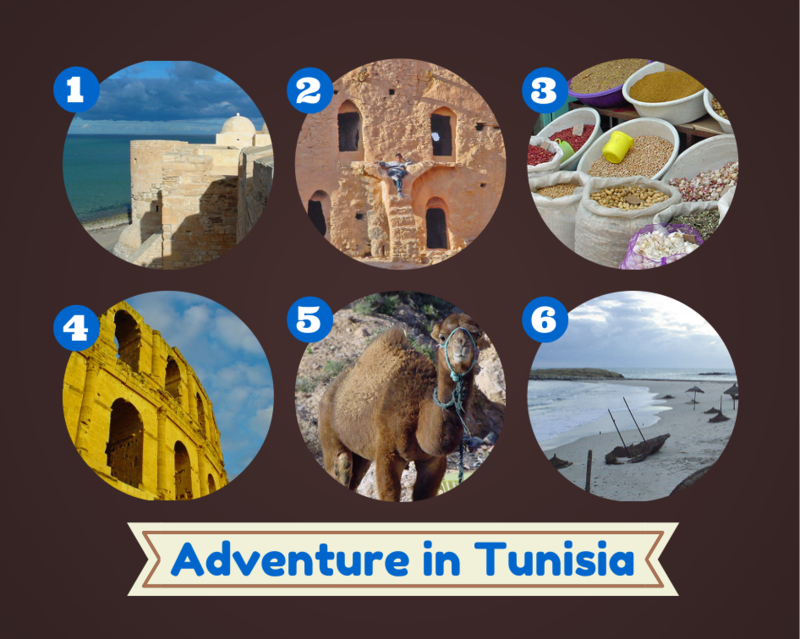 That’s great Fiona – I hope you have a fabulous time there, Tunisia is amazing! A couple of questions as yours is the first blog I’ve seen on travelling Tunisia as a single woman! How easy it was to take a louage as a single woman and without Arab abilities? (I speak fluent French though) especially in the south of Tunisia – are there louages to most major cities that leave often? 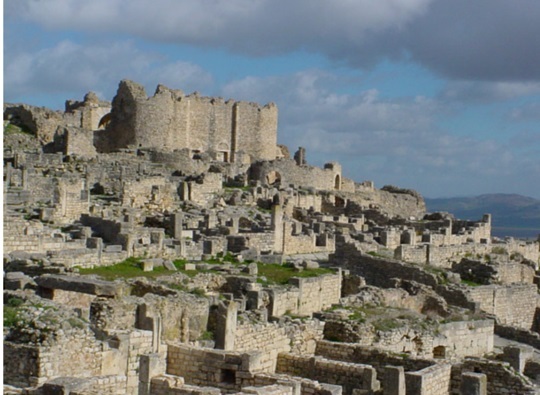 How did you get to Dougga from Tunis? Did you join any tour group for your visit to the Sahara? Thanks for your questions. To be transparent I was actually travelling with a boyfriend but I can still help with some of your questions. – we were taken by a private guide into the Sahara, there were small tour companies everywhere offering various tours. A few times I walked around alone while my boyfriend was off taking photos etc and while I got a lot of unwanted attention,I didn’t feel unsafe, just annoyed. Enjoy – Tunisia is amazing! I’ve read your blog and already just finished around 70% of my itin specially for the route and tourist spots. I am eager to know are the drivers of louage give us the real fare as same as local people? as i heard the situation very different from Morocco.